Trailhead and parking area are on Rt. 25 in Tuftonboro, NH, 3.9 miles east of Rt. 109. Just east of Sodom Road, over a bridge, is the parking area. It is on the north side of the road. There is no sign marking it. Mt. Shaw is the highest mountain in the Ossipee Range. It is within the Castle in the Clouds Conservation Area and can be reached from their trails, but a shorter, more direct, and more exciting route is via the privately owned trails on the south side of the mountain. This route crosses two sub peaks on the way: Big Ball Mountain (also called Tate Mountain) and Black Snout. The trail begins in a small parking area at the beginning of a logging road. From the parking area, follow the logging road into the forest. This is Mt. Shaw Trail. There are no trail signs, so follow directions carefully. Many other roads diverge from the main one. Make sure to stay straight. Soon, it meets Fields Brook at a pleasant little cascade. The logging road then continues to another cascade and forks, 0.4 miles from the parking area. Bear right onto Tate Mountain Trail. Watch for the red and green striped blazes. The beginning of this trail turns onto different logging roads and trails multiple times, so it is helpful to stop at each intersection and look for blazes. After this confusing section, it turns off onto a forest trail. Follow this trail for 1.2 miles in total to its end at Banana Trail, which is marked with blue blazes and has a sign facing away from you (pointing the way back to the trailhead). Bear right and follow the Banana Trail for a short distance to get to the Big Ball Mountain viewpoint, where you are rewarded with a fine 180-degree viewpoint to the south at the Belknap Range and Lake Winnipesaukee, to the southeast at the Moose Mountains, and to the east at Dan Hole Pond. Retrace your steps back to the junction and bear right to continue the other direction on Banana Trail. It passes over the south peak of Big Ball Mountain, dips slightly, and ascends to the ledgy summit in 0.3 miles, where there is another good viewpoint with views to the west and up at Black Snout. The trail continues down off the summit and along the wide ridge between Big Ball and Black Snout. It crosses the LRCT property boundary line and begins a much steeper ascent. At first, it angles up the side of the mountain, but soon turns to travel straight up the hill. After a short, strenuous climb, the trail enters an overgrown field, turns sharply left, and ends at Black Snout Spur, one mile from Big Ball Mountain. Here, you enter the LRCT trail network. Turn left and proceed 0.1 miles to the summit of Black Snout on a wide, grassy trail. From the summit, there are good views in the same direction as the Big Ball Mountain view, although they are somewhat restricted by trees There is also a view at nearby Mt. Shaw. To continue to Mt. Shaw, backtrack to the unmarked (and difficult to notice, even though you came up this way) junction with the Banana Trail, and continue straight on the grassy path (Black Snout Spur) for 0.2 miles. At the end of this trail, turn right onto Black Snout Trail, another grassy path through the forest. Immediately pass an unmarked junction with Thunderbird Trail on the right (easily missed; not important to notice anyway), continue 0.3 miles, then bear right onto High Ridge Trail (which also goes left). Long switchbacks make it an easy 0.4-mile ascent ascent to Mt. Shaw. 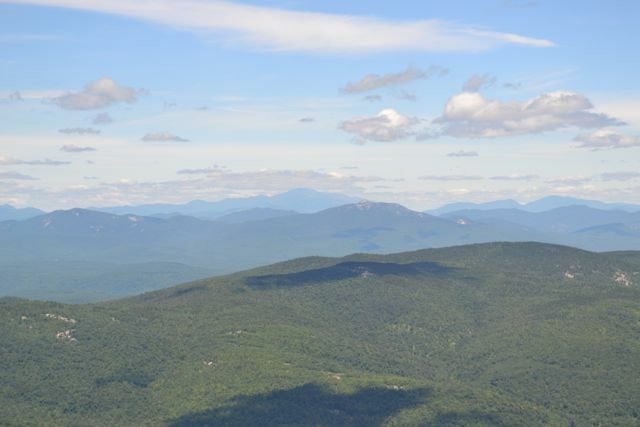 From the summit, there is a directional view to the north, looking over the northern Ossipees to the White Mountains and to the northeast at Ossipee Lake. There are two log benches at the top. To descend from Mt. Shaw, return the way you came all the way back to the junction with Black Snout Spur. Bear right and continue on Black Snout Trail, instead of returning to Black Snout. Descend gradually for 0.2 miles to the unmarked junction with Mt. Shaw Trail. Look for an LRCT trail sign on the right side of the trail; the Mt. Shaw Trail turns left across from this. After a short, steep descent, the trail joins a brook and gradually descends along it, crossing twice and passing several small cascades. After two miles on this trail, pass the junction with Tate Mountain Trail and return to the parking area the way you came.